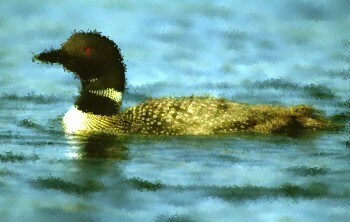 There is nothing common about the Common Loon (Gavia immer). It is believed to be the most primitive bird on the planet, and is very close in body plan to the Hesperornis, an aquatic bird from 100 million years ago. In Abenaki language, this bird was called “Medawihla,” and was considered the “magic or shaman bird.” In Abenaki folklore, the loon was Klozkap’s [Glooscap/Gluskabe] huntsmen, and they go through the world looking for their master wailing sadly because they cannot find him. Loons are also called the “Great Northern Diver,” and they breed in Canada, Greenland, Alaska, and the northern United States (including New Hampshire). They winter on the sea coast or on large lakes. A loon’s three front toes are full webbed. It has red eyes. In spring and summer a loon’s head is dark green with a black back, profusely marked with “squarish spots of white,” and it has a white underbody. There are rings of white and black around its neck. In the fall and winter the back color turns to gray. The loon prefers to live on secluded lakes, ponds or estuaries. It can stay underwater for long periods. Clumsy, and therefore vulnerable on land, the female nests close to the water. Loons feed on fish, sometimes diving as deep as 200 feet (60 m) to consume pike, perch, trout, sunfish and bass. When living near salt water, they will eat flounder, sea trout, rock cod and herring. Loons are monogomous, forming long-term pair bonds, and the male selects the nest site. The word “looney” means “absurd, crazy, or foolish,” and its use may have arisen as a reference to the loon’s strange sound. New Hampshire Loons Still on the Decline…. Nearly half of all adult loon deaths on New England’s breeding lakes were determined to be the result of the birds ingesting lead sinkers and jigs left behind by fisherman. Leading the way to protect loons, on January 1, 2000 New Hampshire became the first New England state to outlaw lead weights in fishing tackle. Despite this five year ban on lead sinker use in New Hampshire, 5 of 11 adult loons found dead and collected in 2005 confirmed lead poisoning at the cause of death. In addition, recently twenty loons were found frozen to death, or dying on Lake Winnipesaukee. Scientists speculate that the group mistook “black ice” for open water, and upon landing were not able to get airborne (they need a quarter of a mile of open water to take off). The fact that so many of these usually solitary birds were found in one location remains a mystery. This entry was posted in Current Events, History, Native Peoples and tagged bird, Common, crazy, duck, gavia, immer, loon, loony, New Hampshire, NH, sound. Bookmark the permalink.